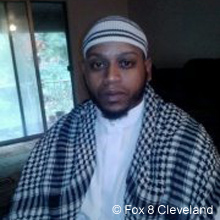 Amir Said Abdul Rahman al-Ghazi, a U.S. citizen previously known as Robert C. McCollum, is an alleged homegrown extremist and supporter of ISIS.Jen Steer, “Man arrested on terrorism-related charges in North Olmsted,” Fox 8 Cleveland, June 19, 2015, http://fox8.com/2015/06/19/man-arrested-on-terrorism-related-charges-in-north-olmsted/. Ghazi caught the attention of the FBI through his online propagandizing for ISIS, including his online pledge of allegiance to ISIS leader Abu Bakr al-Baghdadi.ldquo;Criminal Complaint,” United States District Court, Northern District of Ohio, June 19, 2015, http://www.justice.gov/opa/file/479731/download. In June 2015, Ghazi was arrested and charged with providing material support to a foreign terrorist organization, possession of a firearm as a felon, and drug distribution.“U.S. Citizen Arrested for Attempting to Provide Material Support to ISIL and Other Federal Offenses,” FBI, June 19, 2015, https://www.fbi.gov/cleveland/press-releases/2015/u.s.-citizen-arrested-for-attempting-to-provide-material-support-to-isil-and-other-federal-offenses. He pled guilty to those charges on March 16, 2016.Phil Helsel, “Ohio Man Pleads Guilty to Trying to Help ISIS,” NBC News, March 16, 2016, http://www.nbcnews.com/news/us-news/ohio-man-pleads-guilty-trying-help-isis-n540466. The FBI employed several confidential human sources (CHS), or informants, to monitor, interact with, and collect information on Ghazi. According to the FBI’s criminal complaint, Ghazi expressed to the CHS his desire to create ISIS propaganda videos and to conduct terrorist attacks in the U.S.Jen Steer, “Man arrested on terrorism-related charges in North Olmsted,” Fox 8 Cleveland, June 19, 2015, http://fox8.com/2015/06/19/man-arrested-on-terrorism-related-charges-in-north-olmsted/. Ghazi was arrested in June 2015 after purchasing an AK-47 rifle from an undercover agent. According to the FBI, Ghazi had planned to use the rifle as a prop in self-made propaganda videos supporting ISIS. After Ghazi’s arrest, agents also discovered a handgun, sword, and ISIS flag at Ghazi’s home. On March 16, 2016, Ghazi pled guilty to attempting to provide material support to a foreign terrorist organization and firearms charges.Phil Helsel, “Ohio Man Pleads Guilty to Trying to Help ISIS,” NBC News, March 16, 2016, http://www.nbcnews.com/news/us-news/ohio-man-pleads-guilty-trying-help-isis-n540466. Born as: Robert C. McCollum“Criminal Complaint,” United States District Court, Northern District of Ohio, June 19, 2015, http://www.justice.gov/opa/file/479731/download. @amiralghazi76Amir Al Ghazi“Criminal Complaint,” United States District Court, Northern District of Ohio, June 19, 2015, http://www.justice.gov/opa/file/479731/download. Abu Ahmed al Amriki“Criminal Complaint,” United States District Court, Northern District of Ohio, June 19, 2015, http://www.justice.gov/opa/file/479731/download. Abu Sadiq al Ghazi“Criminal Complaint,” United States District Court, Northern District of Ohio, June 19, 2015, http://www.justice.gov/opa/file/479731/download. abusadiq“Criminal Complaint,” United States District Court, Northern District of Ohio, June 19, 2015, http://www.justice.gov/opa/file/479731/download. Amir Muwahid“Criminal Complaint,” United States District Court, Northern District of Ohio, June 19, 2015, http://www.justice.gov/opa/file/479731/download. amirmuwahid76“Criminal Complaint,” United States District Court, Northern District of Ohio, June 19, 2015, http://www.justice.gov/opa/file/479731/download. Amir Said Abdul Rahman al-Ghazi, a U.S. citizen previously known as Robert C. McCollum, is an alleged homegrown extremist and supporter of ISIS. “I have a confession tho I want to kill these kuffar [nonbelievers] bad … When skeikhadnani said we have lions who feed on blood and carnage. You don’t fear death anymore its like walking thru a door for a martyr u know.”“Criminal Complaint,” United States District Court, Northern District of Ohio, June 19, 2015, http://www.justice.gov/opa/file/479731/download. “… but real men die on the battlefield, I don’t want to die in a cell. I don’t want to die surrounded by my children in my bed. I want to die in a cell. I don’t want to die surrounded by my children in my bed. I want to die on the battlefield. I want to die fighting.”“Criminal Complaint,” United States District Court, Northern District of Ohio, June 19, 2015, http://www.justice.gov/opa/file/479731/download. “Remember something. If you are a Muslim and you have given bayah [allegiance] to Abu Bakr al-Baghdadi, you are a citizen of the Islamic Sate. It doesn’t matter. You can be from the North Pole. You feel me? You don’t have to be in Iraq or Syria to be a citizen of Dawla, to the Islamic…The Feds ever knock on my door they’re probably never gonna let me out. Once they do the bar graph and all that. Its either die in jail or die right now.”“Criminal Complaint,” United States District Court, Northern District of Ohio, June 19, 2015, http://www.justice.gov/opa/file/479731/download. “The bros in Dawla [ISIS] said for us to keep up jihad on the internet. We squading up on line lol.”“Criminal Complaint,” United States District Court, Northern District of Ohio, June 19, 2015, http://www.justice.gov/opa/file/479731/download. “The time grows near when the Mujahideen of the Americas will realize that We will be the tip of the sword of the Khilafah [caliphate].”“Criminal Complaint,” United States District Court, Northern District of Ohio, June 19, 2015, http://www.justice.gov/opa/file/479731/download. “What you all don’t get is that we sunni Muslims love Allah and his prophet more than we love our mothers. We are all Islamic state citizens. This isn’t some gang in the desert you’re fighting. This is ww3 the beginning has just begun.”“Criminal Complaint,” United States District Court, Northern District of Ohio, June 19, 2015, http://www.justice.gov/opa/file/479731/download. “We are here everywhere the caliphate has been established the rise of Islam is upon you.”“Criminal Complaint,” United States District Court, Northern District of Ohio, June 19, 2015, http://www.justice.gov/opa/file/479731/download. “Baqqiyah The Islamic state will remain, it has been established woe to you kuffar [nonbelievers] who aim your arrows in the direction of the Muslims be it here in America or abroad.”“Criminal Complaint,” United States District Court, Northern District of Ohio, June 19, 2015, http://www.justice.gov/opa/file/479731/download. “Islamic state in America.”“Criminal Complaint,” United States District Court, Northern District of Ohio, June 19, 2015, http://www.justice.gov/opa/file/479731/download. “Understand Islamic state has no borders.”“Criminal Complaint,” United States District Court, Northern District of Ohio, June 19, 2015, http://www.justice.gov/opa/file/479731/download. “Islamic State is our caliphate like it or not.”“Criminal Complaint,” United States District Court, Northern District of Ohio, June 19, 2015, http://www.justice.gov/opa/file/479731/download. “Join the Islamic State If not represent the caliphate where You Are America to Australia. We Are Commanded To Fight Where Are You muslims.”“Criminal Complaint,” United States District Court, Northern District of Ohio, June 19, 2015, http://www.justice.gov/opa/file/479731/download. “Jihad is our only option to establish the law of Allah azzawajjal [God almighty] everywhere.”“Criminal Complaint,” United States District Court, Northern District of Ohio, June 19, 2015, http://www.justice.gov/opa/file/479731/download. “America is worried about IS recruiting, bayah [allegiance] has been given they’re too late.”“Criminal Complaint,” United States District Court, Northern District of Ohio, June 19, 2015, http://www.justice.gov/opa/file/479731/download. In reference to beheadings: “… and you really wanna know what I think? … I support that…That’s our way of life…Yeah, I go for this…I’m uh…I do this.”“Criminal Complaint,” United States District Court, Northern District of Ohio, June 19, 2015, http://www.justice.gov/opa/file/479731/download. In reference to pledging allegiance to ISIS: “Naam [yes] I’m ready to make bayah [pledge of allegiance].”“Criminal Complaint,” United States District Court, Northern District of Ohio, June 19, 2015, http://www.justice.gov/opa/file/479731/download.